One of the finest services that Google is offering for managing and designing your web page is Google Analytics. This feature allows you to give more attention to significant ratios like conversion, tracking records of your web pages. Often the issue is observed that numerous Magento store owners do not have a sound awareness of the services which Google Analytics is providing related to tracking. This feature offers in-depth insights of your web page’s traffic, visitor segmentation, demographics visualization and objective related tracking. To give your e-commerce business an edge and new dimension these services play an important role. – In the section of Ecommerce Settings, Enable Ecommerce set-up and then turn on Enable Enhanced Ecommerce Reporting. Next, click on Submit and your Google Analytics is now set for gathering and tracking the data records from your Magento web page. Next thing you have to do now is to set up Google Analytics for your Magento web page. For this purpose, you should copy your Google Analytics Account Id. (which you set in the previous step) then from your Analytics Admin Board, Go to Account Settings and here you will see your Google Analytics Id. Now Copy it from there. Next step you have to go to your Admin Panel of Magento and from there follow this path: System > Configuration > Google API > Google Analytics. Go to the drop down menu and Select Yes, then you have to Enable Google Analytics. Next, go to the Account Number Option and add your Account ID here then Click the Save Config button. You are all set to go now! This way by using Google Analytics you can easily track and collect data from your Magento Store. In case you are a user of the old version of Magento then you will possibly come across issues while tracking your data. We suggest that you DO NOT install external plugins or extensions. Instead of that you should upgrade your Magento to the latest available release, after that go to the settings and enable Google Analytics, which will help you to track your Magento web page’s traffic. 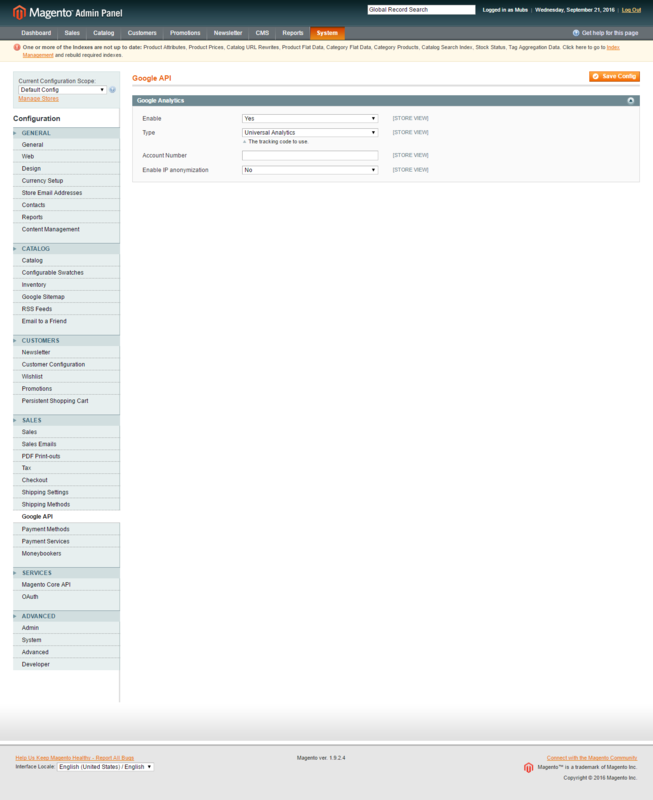 You made a nice post on Configuring Google Analytics on Magento based E-commerce store. Wajid – Keep up the Good work!